Many people decide on learning the piano for the simple joy of being able to play their favourite melodies. And that is a great reason to learn. Music is a much-loved and appreciated art form. It is a well- known fact that learning music can improve your co-ordination. 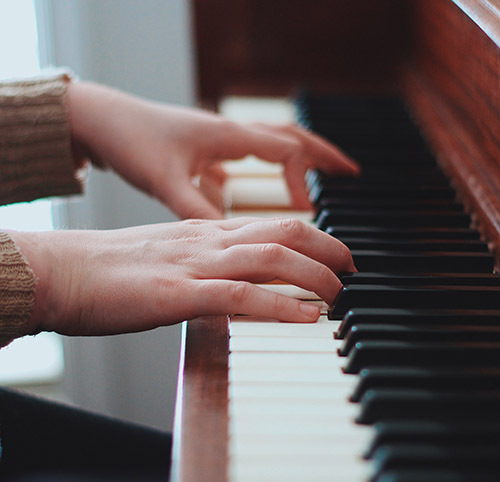 Learning the piano in specific offers a unique benefit – With piano, your hands are required to perform two different tasks at the same time. For example, one hand may play a slower melody, while the other hand plays more rapid notes. The physical and also mental dexterity that you develop as a result has benefits for many other areas of your life. For instance, you will pick up touch typing more quickly, and it will benefit you on the sports field. Learning to play the piano calls on the brain to perform many tasks simultaneously. Thus, learning the piano is gym for your brain. Especially when learned in childhood, this has long-lasting cognitive benefits. The piano develops similar thinking skills that are required for maths, engineering and science. Thus, piano has a positive knock- on effect on these areas of study and may even raise test results. As students learn the piano, they naturally begin to memorise portions of the music. This enhances the brain’s planning ability and short-term and long-term memory function. Learning the piano improves concentration and complex thought processes. The cognitive benefits gained by learning the piano last for the rest of your lifetime, even slowing down the cognitive decline of old age. Kids have a sense of achievement from their very first piano lesson as they learn their first tune. This only increases with each new song that is mastered. As we progress in music, in ensemble work we learn to interact with other musicians and with a music director. We learn the value of our own role in the group, and also how to appreciate the perspectives of other musicians, even learning how deal with some difficulties and criticism. These team skills are valuable in any professional environment. Learning the piano takes a great deal of time and patience. Building some significant skills can take months, even years. It is important to understand that learning is a journey. Accepting that when you can’t it right the first time, you still need to keep going, builds your patience and perseverance. These are valuable life- skills in a world where we are accustomed to getting knowledge and satisfaction at our finger tips. How do you climb a mountain? One step at a time. Learning an instrument broadens your horizons. Kids may develop a love for a style of music that they wouldn’t ordinarily have listened to – like Bach, Beethoven or Mozart. Can Mr. YouTube teach me to play the piano? YouTube may get you started. But to lay a good foundation, a foundation that lasts for a lifetime, you will need the right teacher. Come for piano or keyboard lessons!